By Melanie Cathman, Senior Development Specialist, Gilson, Inc.
Once a technology that only a few knew how or could afford to use, mass spectrometry is moving into more mainstream analytical environments. This move requires changes in instrumentation design, making it easier to use and maintain, while improving productivity and lowering operational and maintenance costs. Mass spectrometry, first introduced in the early 1900s by Dr. Joseph Thompson, is known as a powerful tool for identifying, characterizing, and purifying compounds. However, the instrumentation and analysis has required highly trained technical staff and a highly specialized lab, limiting the reach of the technology. In many cases, lab users are forced to outsource samples to dedicated facilities for MS analysis, increasing costs. Things are changing. Mass spectrometry, once held in the bastion of specialty laboratories, is moving more into mainstream pharmaceutical, biotechnology, and academic laboratories. The power that mass spectrometry provides in the confirmation of compounds in a mixture has become valuable to many areas such as drug discovery purification. To address this shift of use to a broader, non-expert audience, many scientists and instrument companies are rethinking mass spec instrument design. With these redesign efforts, “Mass spec for the masses” (1) has moved from concept to reality. While the use of mass spectrometry in the characterization and confirmation of drug compounds is highly valuable, it is also expensive. Pharmaceutical, biotech and chemical companies, as well as academic labs, are looking at a variety of approaches to control the escalating costs of purification during drug discovery from increasingly complex materials using mass detection techniques. First, they want to decentralize the characterization process to reduce overhead costs. Usually, chromatographic fractions are sent to a dedicated mass spectrometry lab for further analysis. The large mass spectrometers used require specialized lab space because of their size, their system requirements, and the noise they generate. These instruments also need highly trained personnel to run them and highly trained service engineers to maintain them. For decentralization to work, mass spectrometry instrumentation must become smaller in size so it easily fits into any chemistry lab. It also must become easier to use to increase the accessibility of the instrument to entry level spectroscopists and other less experienced lab personnel. A push button solution is needed that requires less formal training. Next, companies want to decrease the cost of ownership associated with mass spectrometers. Traditional mass spectrometers use large amounts of resources such as power and nitrogen. More importantly, many issues affecting the performance of a mass spectrometer need much more involved repairs, typically requiring a scheduled visit from a field service engineer. The instrument downtime can generate delays for characterization of samples, impacting productivity and increasing costs. A new breed of mass detectors is currently focusing on meeting some of these needs through instrument miniaturization. However, as Alessio Zammataro pointed out, “Smaller is a challenge,” given constraints of electronics, physiochemical laws and intellectual property. (UV/VIS). However, UV/VIS is limited and uncertainty usually exists over the exact contents of a fraction and the purity of the sample. This uncertainty leads to a second stage in the workflow: precise identification of the compound(s) in the fraction and their purity through single quad mass spectrometry at a separate specialized lab. This second phase results in additional time and money. 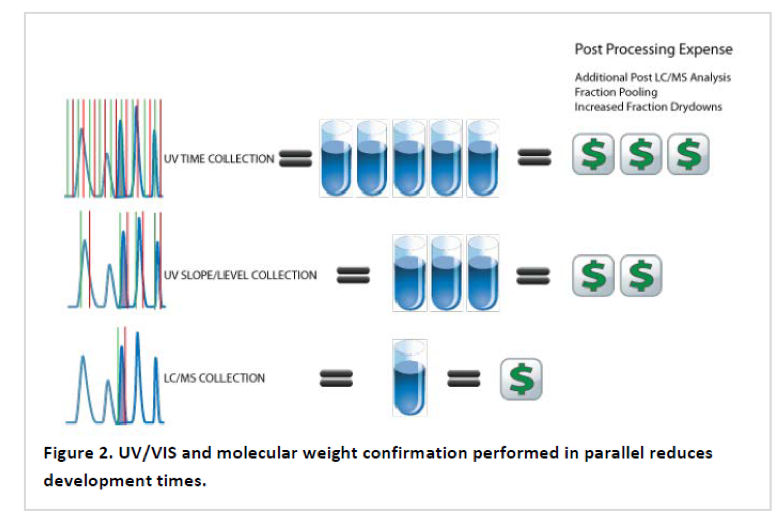 By adding the VERITY® 1900 MS Detector to the drug purification workflow, the monitoring of the collected LC fractions is done with both optical and mass detection (UV/VIS and MS) in tandem, allowing fractions to be clearly identified and the purity determined in a single step. Running the UV/VIS and MS detection in parallel eliminates the additional time required for offline mass spec analysis and the necessity for a specialized lab dedicated to that analysis. Time savings due to mass detection during the initial step allows fraction collection to be more specific, resulting in fewer fractions to process later. The VERITY® 1900 MS Detector also decreases costs associated with ownership, as it has fewer system requirements for resources such as power and nitrogen. The system is also easier to maintain (e.g., no pump oil changes are necessary), and instrument downtime is significantly reduced, improving productivity and saving money. Many routine maintenance items are also customer serviceable, eliminating the need for a service visit. If a rare performance issue arises, one usually only needs to swap in a new chip to fix the issue. As Alessio Zammataro summed up, “What we have achieved with this product is to maintain the standard performance of a general mainframe single quad benchtop mass spec, but have reduced its running costs and footprint.” Thomas Rawlins also noted, “I am excited to offer scientists a product that really changes the way they think about MS technology. 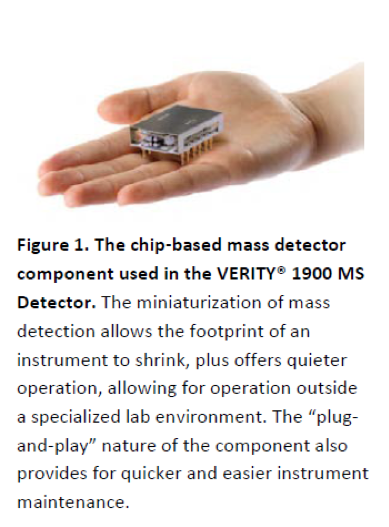 With a chip-based mass detector, the site requirements, maintenance costs, and footprint become more similar to a basic UV/VIS detector than a traditional single quad MS.” The easy to use single quad VERITY® 1900 MS Detector with its proprietary chip-based technology frees the mass spec from a dedicated specialized lab, allowing mass detection to move into the mainstream. Dove, A. (2008). Mass Spectrometry for the Masses. Science DOI:10.1126/science.opms.p0800022.